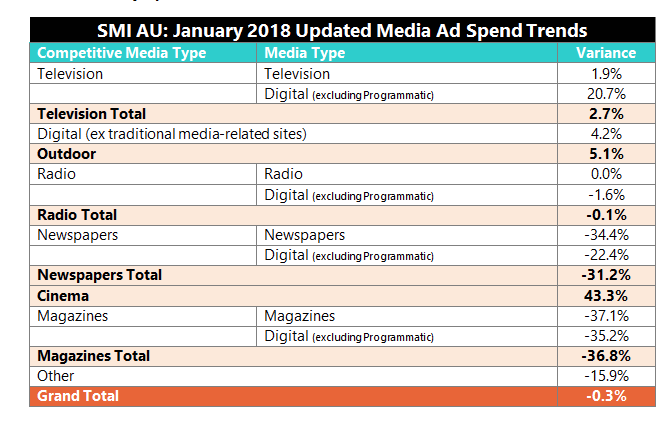 Australia’s media agency market has kicked off 2018 in a stable fashion with the updated January media ad spend data from Standard Media Index (SMI) showing the total back just 0.3 per cent from last year’s record January result at $461.5 million. And this data release – which compares to the 8.2 per cent decline reported before two weeks ago before late digital and other media bookings were added – represents the first full update of SMI’s media ad spend data at the end of the month, with the company previously only re-releasing the digital totals to capture that media’s late digital bookings. In the past two weeks, SMI has collected an extra $36.2 million in late bookings with the vast majority ($29 million) being for digital media. So that’s resulted in demand for digital ad spend growing to 2.3 per cent in January, with the month’s digital data also notable for the fact that agency spending to search has overtaken the amount spent on content sites. This is mostly due to digital publishers facing more pressure to trade through programmatic platforms rather than directly with media Agencies. It’s also worth noting that the 2.3 per cent growth rate for Digital is also the third lowest reported for the media in SMI’s ten-year data history. Elsewhere the updated data showed the year-on-year increase in pure broadcast TV spending grew from 1.3 per cent to 1.9 per cent, and the early 0.3 per cent increase in outdoor ad spend lifted to an increase of 5.1 per cent. SMI AU/NZ managing director Jane Ractliffe said in the future all data would still be released to subscribers and Agency partners on the 15th of each month, but they would then also receive fully updated media and category databases at the end of the month. And all public announcements on the top-line media trends will also move to the end of the month to ensure the most accurate data is being released publicly. “As the digital media continues to grow in size, so too has the degree to which SMI’s mid-month data is being affected by late bookings to that media. And that’s not going to change as the nature of Digital media means it’s impossible to know the final cost of a campaign before the end of the month and to, therefore, pay for it in that time frame,’’ she said. Ractliffe said that as the speed at which the media world continues to evolve continues to accelerate there was an increasing reliance on the SMI data so it was even more important that SMI’s subscribers and agency partners had the most up-to-date data available. Among the major product categories, Ractliffe said an extra $1.4 million in late bookings came in for the restaurants category in January, growing the level of YOY increases for that category from 6.2 per cent previously to 12.5 per cent now.